Bersoft Array Analyzer is an application for analyzing Elisa and Western Blot arrays and any other basic arrays or whatever kind of images arranged in grids you may have. It has a very accurate automated spot finding features. Also grids can be defined manually and stops can added, or removed easily. To know in depth its features and interface you can read the Online Manual and/or download the evaluation version. 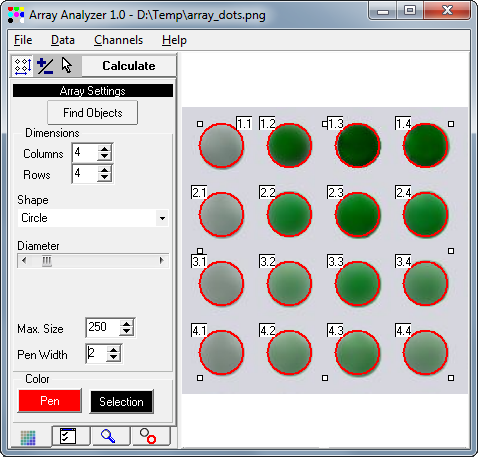 The free evaluation version of Bersoft Array Analyzer only opens images saved in the proprietary IMB file format, but the full version supports many different image types. Multiple IMB images are available at our website for your convenience, but if you prefer to test the program with some of your own images we can convert up to three images, free of any charge, to help you evaluating fully the product.